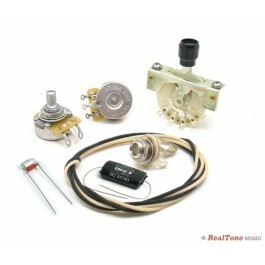 These kits are perfect if you are looking to upgrade the electronics in your Tele Style Guitar to top quality components. The differences between the Standard Upgrade Kit and the Deluxe Kit are the Oil Paper Capacitor and Vintage Cloth Wire. 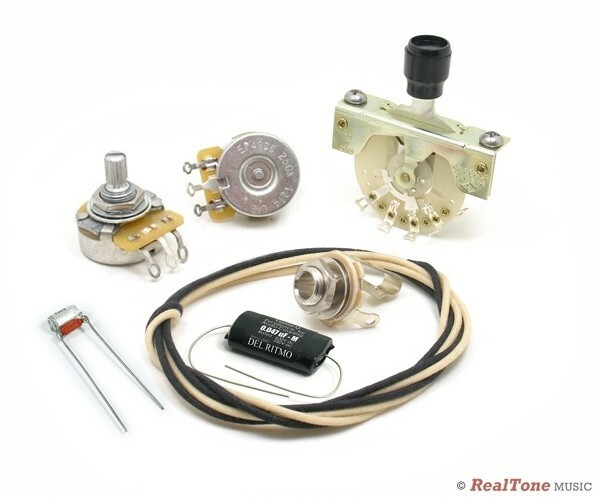 This kit includes the Emerson Custom Treble Bleed mod capacitor/resistor, which retains treble frequencies and reduces unbalanced rolloff when you roll the volume back. Choose between 6mm Split Shaft Pots and 6.35mm (1/4") Solid Shaft Pots. If your guitar currently uses split shaft pots, choose split shaft, as the existing knobs may not fit solid shaft pots. $72.00 parts value if purchased individually. We take the best components on offer, and package them in an array of wiring upgrade kits. From CTS Pots to Switchcraft Switches and Jacks, we only include the best quality parts that will last. Our kits are the perfect solution when it comes to rewiring or upgrading the electronics in your guitar.